Vancouver, BC - Skyharbour Resources Ltd. (TSX-V: SYH) (OTC Grey: SYHBF) (Frankfurt: SC1N) (the “Company”) is pleased to report the results of its recent drill program on its 50% owned Preston Uranium Property (the “Property”). Two out of fifteen previously identified target areas were selected for preliminary drill testing this past summer. Five holes totaling 1,318 metres were completed which included three in the Canoe Lake target area and two in the FSA target area. The Preston Property is strategically located proximal to Fission Uranium’s shallow, high grade Triple R deposit and NexGen Energy’s Arrow discovery in the Patterson Lake region of northwestern Saskatchewan. The Property also extends for approx. 40 kilometres length along the contiguous east-west property border with NexGen’s flagship Rook-1 project. Diamond drilling of EM conductors and coincident gravity lows successfully intersected anomalous radioactivity and sulphide mineralization associated with strongly altered (hematite-chlorite-sericite and clay) and structurally disrupted lithologies, and in particular graphitic units. This is conceptually consistent with being within a mineralization halo and is common to many Athabasca Basin uranium deposits. A minimum of three well defined, hydrothermally altered and structurally disrupted graphitic conductors were intersected in the Canoe Lake target area. The hydrothermal alteration is most pronounced in holes PN15001 and PN15003. Sulphide mineralization is common to all three holes. Well-defined, hydrothermally altered and structurally disrupted graphitic conductors were also intersected in the FSA target area. Of particular interest is PN15005, where nearly the entire hole was altered, sheared and contained sulphide mineralization including a 25 metre wide graphitic unit. The 2015 summer diamond drill program consisted of five drill holes (PN15001 �" PN15005) totaling 1,318 metres. These holes targeted assorted ground geochemical anomalies associated with recently completed ground EM and gravity surveys conducted in furtherance of a 2013 airborne EM and magnetometer survey. All five of the holes intersected between one to three well-defined conductors consisting of significant amounts of structurally disrupted and altered graphite hosted by sedimentary and high-grade plutonic assemblages. The graphitic units are up to 25 metres wide. Pegmatites (sills and dykes) are common, particularly at or near lithological contacts. Holes PN15001, PN15003 and PN15005 are the most strongly deformed and exhibit a wide variety of structural patterns ranging from brittle fracturing to well-developed mylonitic fabrics. Hydrothermal alteration (chlorite-sericite-hematite-clay) is strongest in drill holes PN15003 and PN15005. Localized silicification was also noted, and quartz veining was common and contained variable amounts of pyrite and chalcopyrite. Pyrite (3 to 10%) was the most common sulphide present and occurred in most of the graphitic units as smeared disseminations and semi-massive fracture fill. Three inaugural diamond drill holes tested the Canoe Lake target area which occurs along an extensive conductive corridor coincident with an airborne magnetic low. PN15001: This drill hole tested the first and second (easternmost) HLEM conductors, coincident with a pronounced gravity low, and lake bottom radon-in-water anomalies, all within the northeast trending Canoe Lake corridor. Just over 70 metres of overburden was encountered. From 70 meters depth to the end of the hole at 389 metres, the dominant lithologies intersected were variably magnetic felsic to intermediate ortho and semipelitic gneisses and locally pegmatites. Silica and sericite alteration markedly increased downhole towards the contact with a strongly altered and sooty graphite-rich, 6-metre wide shear zone from the 123 metre to 129 metre mark. Up to 5% pyrite is present and a 4-metre wide sheared and altered graphitic semipelite begins at 209 metres. A third sequence of sheared and altered graphitic bearing semipelites occurs between 291 and 373 metres. Sooty bands with up to 15-30% graphite are hosted in strongly chlorite altered semipelite with variable epidote, hematite and sericite alteration and locally up to 5% pyrite and 0.5% pyrrhotite. One anomalous gamma survey interval (>500 cps) in granodiorite at 378.4 metres was detected using a Mount Sopris 2SP-1000 downhole survey tool. PN15002: This drill hole tested the southwesterly strike extension of the first HLEM conductor, coincident with a pronounced gravity low, and a broad multi-station lake bottom radon-in-water anomaly zone. Just over 45 metres of overburden was encountered. From 45 meters depth to 255 metres depth the dominant lithologies encountered were weakly altered and magnetic felsic gneisses and an intermediate intrusive. This is followed by a 4 metre wide graphitic shear zone with abundant pyrite, chlorite, and minor clays. Up to 5% disseminated pyrite is associated with the graphite. From 259 metres to the end of the hole at 335 metres chlorite and silica alteration becomes progressively more intense. The highest downhole gamma value was 365 cps from a pegmatite at 274 metres. PN15003: This drill hole tested the third (westernmost) HLEM conductor within the northeast trending Canoe Lake corridor. Overburden depth was 59 metres. Assorted sedimentary assemblages and occasional pegmatites were intersected from 59 metres until the end of the hole at 170 metres. Graphite-rich assemblages hosted by pelites were intersected in a well-developed fault zone from 101 to 148 metres. This interval was strongly deformed. The graphitic units are brittley sheared and accompanied by strong chlorite and variable clay alteration. Up to 10% semi-massive pyrite is associated with the graphite. The pelites exhibit mylonitic to brittle textures and are subject to pronounced hematite-chlorite-sericite+-silica alteration. Five downhole gamma anomalies were detected with three occurring within strongly deformed pegmatites in the upper 5 metres of bedrock. Half metre gamma anomalies were also associated with graphitic rocks at 115 metres and in chlorite altered sediments at 156 metres. The best results from variable core samples include up to 7ppm U, 371ppm Th, and 357ppm Cu with 480 ppb Ag and 15 ppb Au. The FSA target area occurs approximately 8 kilometres northwest of Canoe Lake. Two diamond drill holes tested an east-northeast trending airborne magnetic low coincident with interpreted airborne and ground EM conductors that are in part associated with pronounced gravity lows. In addition to the geophysical anomalies, this target is proximal to structurally deformed outcrop that returned anomalous uranium values of up to 45.7 ppm U from rock grab samples. PN15004: This drill hole was collared 100 metres east of hole PN14009 drilled in 2014. PN15004 tested the southernmost HLEM conductor along with a coincident and pronounced gravity low, and lake bottom radon-in-water anomalies. Overburden depth was 18.5 metres. From 18.5 metres to 150 metres assorted sedimentary assemblages with trace to minor amounts of graphite were intersected. The next 15 metres are strongly altered (chlorite-sericite-epidote-silica) and sheared sediments with minor amounts of pyrite. From 179 to 188 metres there are strongly altered and brittley deformed sooty graphitic units. Individual shear zones are strongly chloritic, sericitic, and have clay-rich fault gouges with up to 10% pyrite. The end of the hole is 212 metres. Four downhole gamma anomalies were detected with three in pegmatites near the end of the hole. The fourth (569 cps) occurs in the graphitic shear zone at 186 metres. The best results from variable samples include up to 1.8 ppm U, 36 ppm Th, and 65 ppm Cu with 1120 ppb Ag. PN15005: This drill hole was located 1.2 km west-southwest of PN15004 and tested the strike extension of the same HLEM conductor. This target also has a coincident gravity low with peripheral broadly spaced radon and biogeochemical anomalies. Overburden depth was 36 metres. From 36 metres to 106 metres strongly deformed and altered (hematite-chlorite-sericite-clay +/- silica flooding) with minor amounts of disseminated and blebby pyrite were intersected. From 106 metres to 131 metres PN15005 intersected a structurally deformed and strongly altered graphitic unit with up to 10% pyrite. Shearing and alteration were strongest along the upper and lower contacts. Assorted pelitic gneisses occur in the hanging wall and footwall of this unit. The end of hole was 212 metres. Three downhole gamma anomalies were detected. The first (708 cps) at 153 metres is associated with the semipelitic rocks. The remaining two gamma anomalies are associated with granodiorite gneiss. The best analytical result was for a sample collected from the graphitic zone at 122 metres. It returned insignificant U and Th values, but was elevated in sulphide associated metals returning 1520 ppb Ag, 18 ppb Au, and 532 ppm Cu. It also returned the highest value of B (44 ppm), Li (72 ppm) and Mo (52 ppm) in the 2015 summer diamond drilling program. 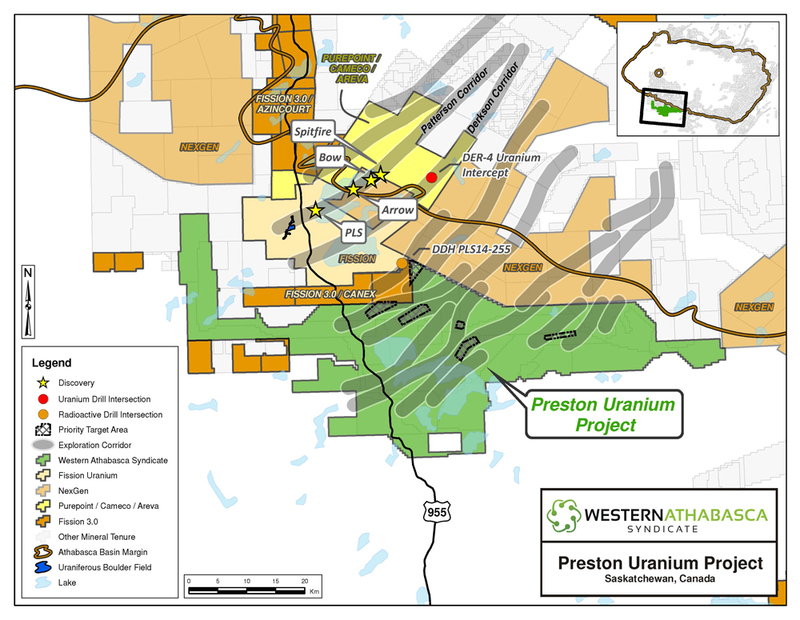 The 127,495 hectare Preston Uranium Property is the largest individual property proximal to Fission Uranium’s Triple R deposit and the recent discovery made by NexGen Energy on the Rook-1 Project. The tremendous potential of the area is highlighted by the recently reported results from Fission Uranium’s Patterson Lake South property with the announcement of the large, shallow, high grade Triple R deposit, which includes 79.6 million pounds at 1.58% U3O8 indicated and 25.9 million pounds at 1.30% U3O8 inferred (See Fission Uranium news release January 9, 2015). Skyharbour and Athabasca Nuclear carried out one of the largest regional exploration programs in the relatively underexplored southwestern side of the Athabasca Basin over the last two years. Over $4.7 million in expenditures on the Preston Uranium Project has been incurred as the result of carrying out ground gravity, airborne and ground EM and magnetics, radon, soil, silt, biogeochem, lake sediment, and geological mapping surveys, as well as boulder prospecting and two exploratory diamond drill programs. 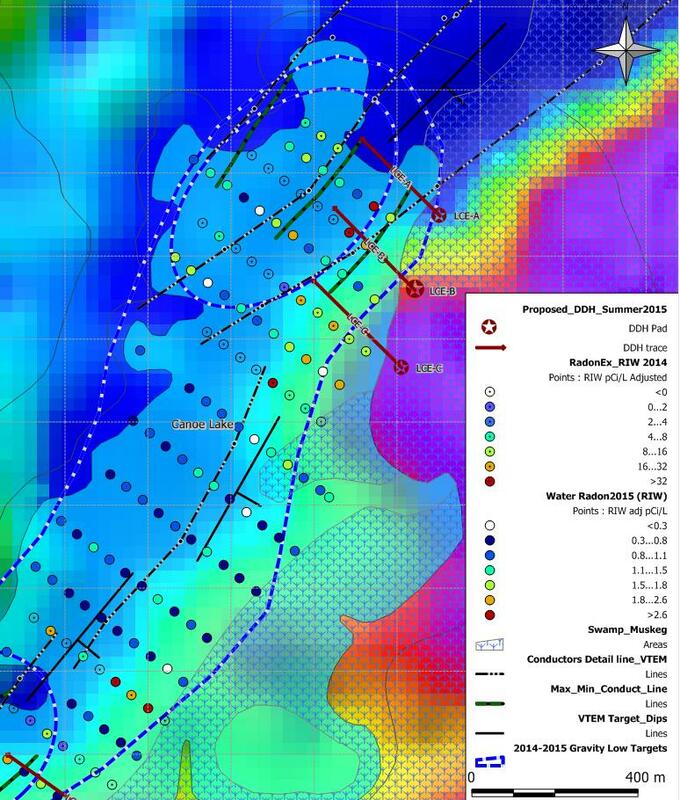 Fifteen high-priority drill target areas associated with eight prospective exploration corridors have been successfully delineated through this methodical, multi-phased exploration initiative which has culminated in an extensive, proprietary geological database for the project area. The technical information in this news release has been prepared in accordance with the Canadian regulatory requirements set out in National Instrument 43-101 and reviewed and approved by Richard Kusmirski, P.Geo., M.Sc., Skyharbour’s Head Technical Advisor and a Director, and a Qualified Person. Skyharbour holds interest in an extensive portfolio of uranium and thorium exploration projects covering over 220,000 hectares in Canada's Athabasca Basin and is well positioned to benefit from improving uranium market fundamentals with four drill-ready projects. The Company owns a 50% interest in a large, geologically prospective land package in the southwest of the Athabasca Basin of Saskatchewan. Skyharbour also owns a 100% interest in the Falcon Point (formerly Way Lake) Uranium Project on the east side of the Basin which hosts an NI 43-101 inferred resource totaling 7.0 million pounds of U3O8 at 0.03% and 5.3 million pounds of ThO2 at 0.023%. The Company owns a 60% interest in the Mann Lake Uranium project on the east side of the Basin strategically located adjacent to the Mann Lake Joint Venture operated by Cameco with partners Denison Mines and AREVA where high-grade, basement-hosted uranium mineralization was recently discovered. Skyharbour’s goal is to maximize shareholder value through new mineral discoveries, committed long-term partnerships, and the advancement of exploration projects in geopolitically favourable jurisdictions.